Even though spring supposedly began way back in March, the world has still felt like a gray and gloomy mess. With the snowstorms, harsh winds, and relentlessly cold weather ruining all the fun, it’s clear that winter does not go down without a fight. The promise of colorful, floral, and sunshine-inducing May is the only thing keeping things in perspective. 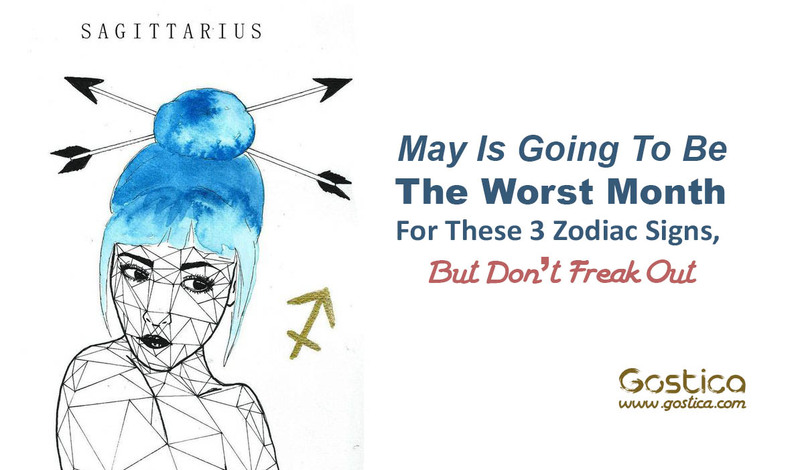 However, not even the vibrant weather will lift everyone’s spirits, because May 2018 will be the worst month for these three zodiac signs: Virgo, Scorpio, and Sagittarius. May is so jam-packed with planetary transitions, I don’t even know where to begin. Mercury and Uranus are entering Taurus, solidifying the ground beneath you. Mars enters Aquarius, opening your mind. Venus enters Cancer, making romance so sugary-sweet that it’s almost cloying. And, drum-roll, please — the sun is officially moving into Gemini on May 20. You might spend the majority of the month feeling exhausted and cranky. On May 16, Uranus, your health planet, makes a heavy move into Taurus and your ninth house of luck, adventure, and expansion. You’ll want to use the first few weeks of May to engage in self-care activities that nurture your body and soul. It’s the only way to prepare your energy for what’s to come. Mars will also bulldoze its way through your sixth house of work and health, further compromising your vitality. Uranus, a ruler of dramatic change and progression, blows fire into your seventh house of partnerships on May 16. It also moves into your opposite sign: Taurus. This can change your relationship with either harmony or strife. However, with Venus sliding next to Saturn and Pluto a few days later, chances are, you and your partner may experience a few bumps in the road. It may feel like neither of you is on the same page, which could cause an argument or two. If you’re single, it might be that much more difficult to connect with a potential lover. The balm to these conflicts is found in your family. While Uranus may be creating conflict in your love life, it also happens to be your family planet. Spending time with your roots could reveal the cure for your problems in love. Your family may have some crucial insight to share. Uranus, the planet of radical change, is making a transformative move into your sixth house of health and work. This could make you rethink everything you thought you knew about your career. However, any attempts to move in a different direction may be thwarted. Your ego is likely to take a dip in confidence because of how unsure you might feel with your job situation. However, this anxiety will ultimately help you cope with the unexpected nature of life in the long run.